I was recently asked to contribute some history and other information on the IPA chart for Babel Magazine's fourth issue. The text below is the unedited version of what appears, with references. I have been given permission to post this to my blog. The International Phonetic Alphabet represents the sounds of all the world’s documented languages. The first published version of this chart can be found in Passy (1888) and appeared in a journal called The Phonetic Teacher (or Dhi Fonètik Tîtcer). This speaks a lot to its origins, as the International Phonetic Association (IPA) itself was inaugurated as the Phonetic Teacher’s Association in 1886 which was mainly involved with teaching English (IPA 1949, p. 2 of cover). During the first two years of the association, and as more than one script was in use, it was decided by its members to establish a single alphabet which could be applied to the description of all languages. Since Paul Passy’s publication of the first chart in 1888, the association has worked tirelessly to improve the alphabet and there have been several published revisions. The alphabet itself is “on romanic basis” (IPA 1949, p. 1), meaning it uses a script which derives from Roman characters rather than e.g. Cyrillic (Russian), Arabic or other written traditions, and is presented by the Association as “a consistent way of representing the sounds of language in a written form” (IPA 1999, p. 3). The current revision of the IPA chart (above) starts with a large table showing consonant sounds, or phones, made on a pulmonic egressive airstream (i.e., with air from the lungs). Place of articulation (POA) is indicated by which column a symbol is located in. The passive articulator is usually indicated, i.e., the part of the oral cavity which remains in place while the active articulator – often the tongue – moves towards it; e.g., if a sound is labelled “alveolar” it means the tongue moves towards the alveolar ridge. Manner of articulation (MOA) is indicated by row. Where voiceless and voiced pairs of consonants are given, the one on the left is voiceless. The usual way of describing a consonant is to use a VPM label, where VPM stands for “voice place manner” – so [t] is a voiceless alveolar plosive. This table is followed by non-pulmonic sounds – clicks, implosives and ejectives – below and to the left, with the vowel chart to the right. The vowel chart represents cardinal values for vowels which can be used as a reference to describe vowel sounds in languages. Symbols are placed on a trapezium which represents the vowel space; this space is in fact very small, with “front” vowels being articulated with the front of the tongue raised to various degrees in proximity to the hard palate, and “back” vowels involving the back of the tongue being raised in proximity to the velum. It is usual to describe vowels in terms of height, backness/frontness and lip rounding – so e.g. [i] is a close front unrounded vowel. Beneath the non-pulmonic sounds are “other”consonantal symbols; these are ones which do not appear in the main chart because they have two POAs, two MOAs, or cannot be otherwise accommodated. E.g., [w] has both lip rounding and a movement of the back of the tongue towards the soft palate, so is labial-velar and therefore classed as a double articulation; [t͜s] is an affricate, which involves a plosive followed by a fricative both produced at the same POA (i.e., homorganic) with the same voicing; alveolo-palatal fricatives [ɕ] and [ʑ] are not on the main consonant chart because that region simply cannot accommodate any further symbols. Beneath this list is a table of diacritics which allow the sounds on the chart to be modified further. For example, the symbol [t] can be modified to represent a voiceless dental plosive by adding the dental diacritic to give [ t̪ ]. Under the vowel chart is a list of symbols for representing suprasegmental information, i.e., phonetic features above the level of individual speech sounds. Here we can find stress marks, length marks, syllable-division marks and suprasegmental boundary markers and, below these, symbols for tones and word accents. Although the alphabet largely achieves what it sets out to do, there are a number of issues which arise. One is simply to do with what people understand this chart to mean. Note that square brackets are placed around each of these symbols: [ ]. This indicates that the symbol is representing the production/articulation of a given sound and not that it is a linguistic unit or a phoneme belonging to any particular language. 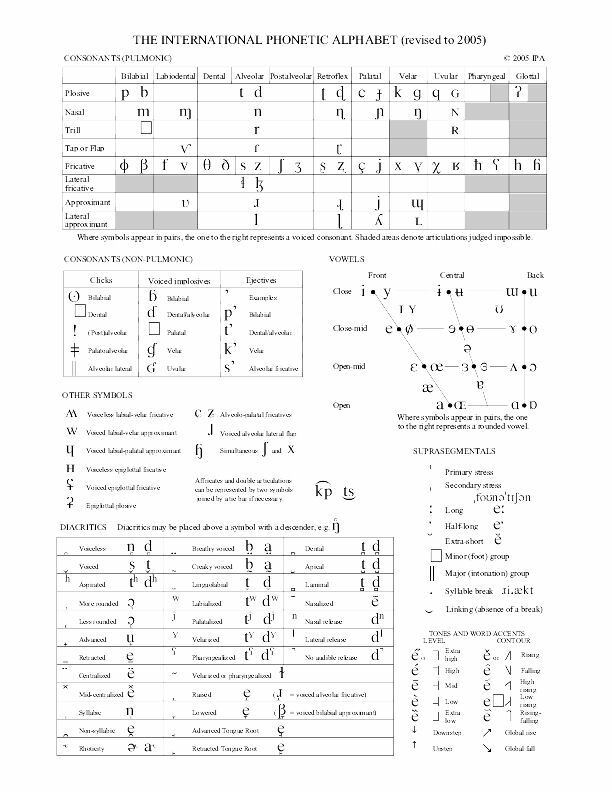 In transcribing languages phonemically, one uses (or “borrows”) a small subset of the symbols on the chart to represent distinctive linguistic units in a language. To show the symbols are used as phonemes in a given language and not as phones or allophones, which are representations of the articulation of a sound, we use slash brackets: / /. In training people to use the chart, it has to be understood that producing a phone such as [p] is not going to be the same as, e.g., an English /p/, which is usually aspirated when at the start of a syllable, even though we have used the same symbol. If your phonetics teacher wants to hear a typical English /p/ sound, it will be represented [pʰ] in phonetic transcription. Another issue is to do with processes for updating or revising the alphabet. There was general rejoicing in the phonetics community when, in 2005, the symbol for the voiced labiodental flap [] was added to the main consonants chart; this was the first revision since 1996. But it is not a matter of someone simply proposing a new sound; evidence must be given for the existence of the sound as a distinctive unit in a given language. More recently, there has been discussion about whether the vowel chart should have a symbol for an unrounded open central vowel as found in German, proposed in Barry and Trouvain (2008), which would be represented with a small capital A [a]. This proposal had in fact been first discussed by the association in 1989 and rejected at that time; Barry and Trouvain (2008) provided a convincing rationale for reconsidering this position, including the fact that there are central vowels at every cardinal tongue height except for in open position, and that there are languages which have this vowel quality in a stable enough way to support representing it on the chart with a single symbol not requiring diacritics (it can, for example, be represented as [ɐ̞], which is the symbol for the most open unrounded central vowel currently on the chart plus the “lowered” diacritic). In December 2011 the matter was finally decided by the IPA council voting against adopting [a] (IPA 2012, p. 245). Something else the basic alphabet fails to cater for is many of the sounds produced by atypical speakers – that is, people with speech deficits – or children in the developmental stages of sound production. For example, some speakers may produce sounds classified as labioalveolar, which means the speaker’s bottom lip touches the alveolar ridge behind the teeth (amongst typical speakers, the furthest back the bottom lip travels is to meet the upper teeth in labiodental sounds such as [f] and [v]). In order to deal with this, an additional chart known as “the Ext-IPA symbols for disordered speech” was devised, where “Ext” is abbreviated from “extensions” (Duckworth, Allen, Hardcastle & Ball 1990; PRDS Group 1983). This currently exists in its 1997 revision in the IPA handbook (1999, p. 193). For information, labioalveolar sounds are represented by a double-underline diacritic combined with a bilabial or labiodental symbol, so a voiced labioalveolar nasal is [m͇] and a voiceless labioalveolar fricative is [ f͇ ]. And yes, it is possible to describe every sound produced with human vocal apparatus with phonetic terminology. Did you know, for example, that when you “blow a raspberry”, you are performing a voiceless linguolabial trill? Or that a “gee-up” noise to encourage a horse is a voiceless alveolar lateral click? Well, now you do. *IPA Chart, http://www.internationalphoneticassociation.org/content/ipa-chart, available under a Creative Commons Attribution-Sharealike 3.0 Unported License. Copyright © 2015 International Phonetic Association. Barry, W. J. & Trouvain, J. (2008). Do we need a symbol for a central open vowel? Journal of the International Phonetic Association 38(3), pp. 349-357. Duckworth, M., Allen, G., Hardcastle, W. & Ball, M. J. (1990). Extensions to the International Phonetic Alphabet for the transcription of atypical speech. Clinical Linguistics and Phonetics 4, pp. 273-280.
International Phonetic Association, The. (1949). The principles of the International Phonetic Association. London: The International Phonetic Association. International Phonetic Association, The. (1999). The handbook of the International Phonetic Association. Cambridge: Cambridge University Press. International Phonetic Association, The. (2012). IPA council votes against new IPA symbol. Journal of the International Phonetic Association 42(2), p. 245. Passy, Paul. (1888). Our revised alphabet. The Phonetic Teacher, pp. 57-60. PDRS Group (1983). The phonetic representation of disordered speech: Final report. London: The King’s Fund. Indeed. There is one for loudly clicking your teeth together (the "bidental percussive" symbol is ʭ)and for yawning (the "faucalized low central vowel" is aꟸ, where ꟸ is a superscript Ħ). No IPA symbol for nose-honking while sneezing, though! I expect you'd have to make up a combination symbol of a nareal fricative with something else ... which would depend on what individuals did when they sneezed! I had a friend who very clearly went [əʔˈtʃuː] in a high-pitched voice - cute! Sorry, I meant blowing your nose, not sneezing. It's thought that the characteristic honk (which not everyone does, and people who do don't always do it and usually can't replicate it on demand) is the result of friction in the nasal turbinates. In that case, definitely a voiceless nareal fricative of some kind, with the diacritic for "strong articulation" added. For POA, it would depend on what the nose-blower was doing with his/her oral articulators. Probably bilabial ..? Er, Hi Jane!, Hi John! What about Harpo Marx’s finger-aided whistles? Finger-aided whistles: Digito-labial, I expect! We were really reading Thai script by the end of the week and I am continuing to learn more every day with the online resources.Do you know what one of the biggest fears is for people a new language of Learn Thai or Learn Thai alphabet? The best way to get to that level of experience is to have an easy to use, workable system. One that is guaranteed to help you achieve your language goals as like Speak Thai, Read Thaiand Write Thai language. How get the international phonetic language version 1999? anyone know?